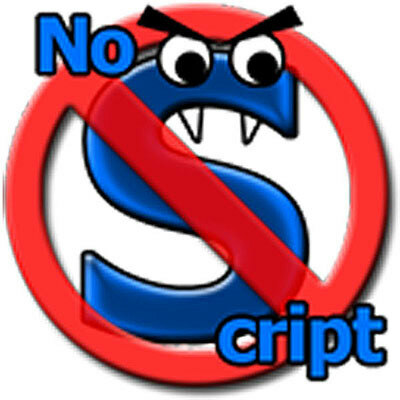 NoScript was created by a developer from Italy called “Giorgio Maone” and another fellow from Mozilla Security Group. The main intention behind the development is to maintain and protect your online browsing activity from mistrusted domains which contain malicious codes and security attacks. Protect your online surfing activity from websites which has XSS(Cross-side Scripting) and Clickjacking vulnerabilities. Filters hugely potential Cross-side Scripting(XSS) attacks from malicious websites. Provide strong defensive mechanism against harmful internet threats like Clickjacking, man-in-the-middle attacks, CSRF, DNS rebinding, etc. 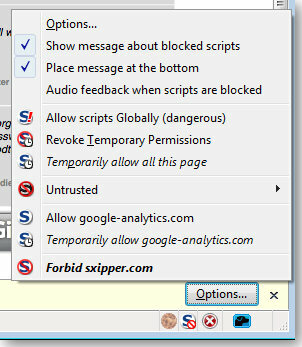 It has options like “Allow Scripts Globally” and “Default Deny” to permit or abnegate all websites to execute all kinds of scripts. A special firewall-like feature is provided called Application Boundaries Enforcer (ABE), to protect each susceptible web application pertinent to the user like Online Banking, Webmail, etc. NoScript could force the browser to open every web application in “HTTPS” connection, which is very beneficial, especially when you are involved in many banking transactions. NoScript has won many tech-awards for providing best and innovative work in online information security. 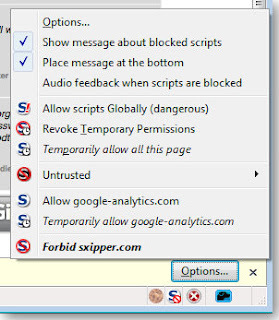 On the other-side, security browser add-ons like WOT, AdBlock Plus, Ghostery, and other well-known extensions had criticized for its unusual behavior on their websites, due to which some of their functionalities had stopped to work. If you want to have a prevailing browser extension for protect from unwanted and suspicious websites during online surfing, go for NoScript.